I read something that made me furious few days ago... Didn't thought of blogging bout it till now! Robin Stanislaus Is there any really really deserving and needy recipient? Or it all went to rich people's children? I was like what the hell??? Hello.... that is like a total insult! Now I am NOT being biased towards Maxis, I mean yes...they provided me scholarship but it is solely my opinion as a Malaysian, a normal citizen on merit-based scholarships!! How can he say that?? Maxis Scholarship for Excellence is solely based on merit and they consider your co-curriculum activities and assess your soft skills through 2 to 3 rounds of interviews... NEVER once they asked me about my parents' income because I believe, it is their principle to acknowledge students' achievements regardless of race, religion and family background! I had had my bad share of scholarships that they think is "fair" because they only award them to the poor or more financially difficult students... I've got interviewer saying that "My family is not poor enough so no matter how good you are, we can't offer you the scholarship"!!! So, is that FAIR??? A student's biggest accomplishment would be recognition of his success! Good students who are "not so poor" are left to fend for themselves but not so good students who are poorer gets the chance to be pampered!!! Sigh....and we have people like that blurting out their so-called-inequality in a social website! Every family has their own problem, including mine. Even though my parents may earn more than average, but little do you know, that they have their own liabilities which the accumulated incomes are barely enough!! E.g. medications due to chronic diseases, personal loans and debts, etc. 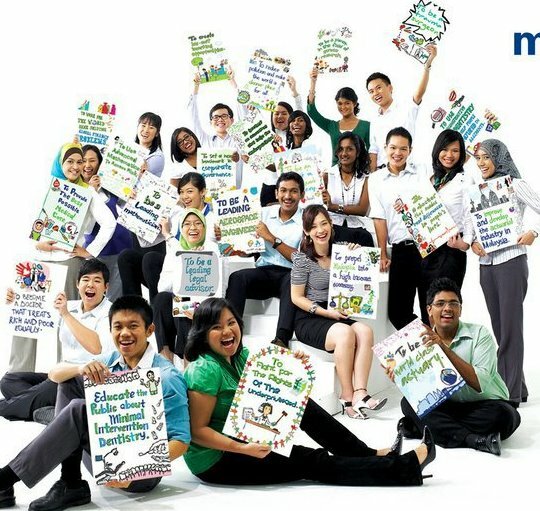 So I would say to organizations like Maxis who are providing merit-based scholarships to the people, A JOB WELL DONE!!! Do continue doing so. There are lots of hopefuls out there who just need your help! So yesterday, 3rd September 2010, was the much awaited day for all Maxis Scholars - it's OUR big day!! The ceremony was held in Hilton KL. Official time was 9 am but recipients were required to come at 7 am for a rehearsal before the real thing!!! It was great to meet up with the Scholars once again that day!!! Sure missed them a lot since the photo shooting session! And you bet there were much yada yada yada and I TOTALLY LOVE their company! Had had a few runs and finally a trial group photo shoot (again) and you bet, chaos! Hahaha.... they were trying to squeeze 29 of us into a camera frame..... I felt like sardines honestly! :P But thankfully..... the camera woman is satisfied after almost 15 minutes of arranging us! LOL! Then, a few of us went for a gathering at Mid Valley mega mall - had lunch, movie and dinner together! And you bet! I had loooottttssssss of fun!! Getting pretty - make-up time! Previously, Scholars were told to write down their dream statement in an A3 manila card. And this was mine - drawn and written by me after getting Maxis approval. 3. Random shoots with AWESOME Maxis Scholars!!! I really REALLY love them - LOADZZZ!!! Maxis ROCKS!!! Maxis Scholars ROCK EVEN MORE!! !